Two bedroomed apartment with fabulous sea views, and your very own private sandy beach right on the door step. Ideal get away for families and couples looking for a quiet and relaxing atmosphere, endless blue skies, turquoise waters and breath taking sunsets. 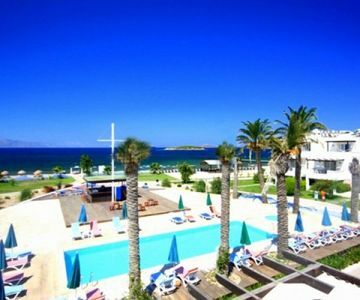 Beautiful two bedroom apartment with balcony and sea view, right on the beach. The apartment is fully funrnished and equipped with all modern conveniences to make your holiday relaxing and enjoyable. The kitchen/dining area is open plan with the living room which opens out onto the balcony where you can enjoy stunning sea views and sunsets in the evenings. There are two bedrooms, the master bedroom has a double bed and en suite bathroom and the second bedroom has twin beds. There is a separate family bathroom.